“Simon’s Cat Logic” is a new series by Simon Tofield that is part educational, part animated and part brand new “Simon’s Cat” episodes. 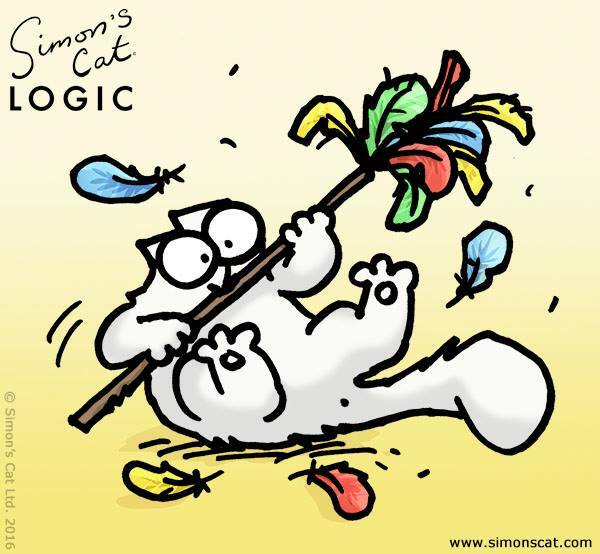 Simon’s Cat Logic is a fun new series where we speak to a Cat Behaviour Expert at Cats Protection about why cats do the silly things they do, and how we can help our cats lead happy and healthy lives. In the first episode, Tofield speaks with Cat Behaviorist Nicky at Cats Protection about the subject of cat “crazy time” and demonstrates with feline buddy Lorenzo, what can be done to redirect a cat’s energy. One of the things you can offer your cat is interactive fishing rod toy play. So this is where you’d get a rod with a string and some feathers at the end and move it around as if it were a prey species, …No self-respecting prey species ever goes up to the cat and says “Hi, here I am!” So try to avoid waving a toy in the cat’s face, have it moving away from them. Cats also can’t see that well under 25 centimeters [10 inches] which is another reason why cats don’t really seem interested in playing when it’s so close to their face. They are a bit more far-sighted so again move the toy away from them and that’s when you see the pupils dilate and they go into the crouch position and do the bum wiggle and go after that toy.